Miss Maria is a dress my daughter has been requesting for some time. She saw a similar dress on a website and asked to sew this one herself. 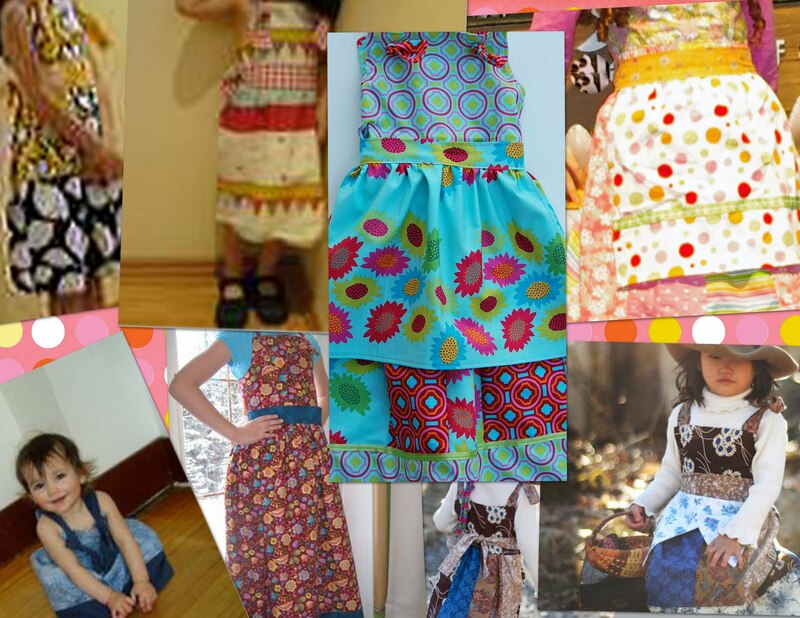 She chose to use many fabrics to create Maria. Some of the colors I didn't think even matched, but they certainly do look great together. We like to wear our Maria with a top underneath in the style of a jumper. It would make a nice sundress also. Wear it with a pair of ruffle pants or capris for another look. You can choose a solid skirt by eliminating the strip section of the directions. You can add the apron option to the sash. Or like ours, you can choose as many colors as you can find. You can even use contrasting threads for top stitching and hemming. Maria can be made from nearly any fabric...your design options are endless. SquigglyTwigs e-patterns are not intended to teach traditional sewing skills. We teach sewists techniques to create fun and easy clothing with their own unique style. This pattern includes bodice pattern pieces for size 6 mo. to size 10 and 18" doll, detailed photos, drawings, and carefully written instructions to enable you to create your own version of Miss Maria. The Miss Maria e-Pattern will be at the introductory price of $3 through March 14th. It will then be at it's regular price of $6. Please...... Get back to me ASAP as I'm very interested and would like this ASAP I'm hoping I can speak with you as I love this dress and don't want to look elsewhere !! Anyone who has a contact for her please mail me it... Or hopefully the owner herself will respond !!! Thanks, REALLY NEED TO SPEAK WITH YOU, NEED THIS DRESS!! !